Week 35 has been another good week! As I sit here writing this, I am trying not to throw up from the indigestion while simultaneously really craving a cookie. It's not always glamorous over here, but pregnancy is still going well! I forgot to mention this last week, but nausea is back. I haven't been nauseous in weeks, so that was unexpected! I just get nauseous when I need to eat, and it's so much more manageable than first trimester nausea. It's just strange that it's back. My amniotic fluid levels increased since last week as well, so I will be doing twice weekly non-stress tests to measure reactivity until I deliver. So far, he has done well at each test. They also told me to monitor movement closely and call if he doesn't move five times in an hour. He's always been a mover, but it definitely brings out a little paranoia having to count kicks and movements. So far, he's moved plenty and hasn't given me any cause for concern. The biggest surprise was that I am actually 2 cm dilated. The doctor said this isn't too uncommon considering my amniotic fluid levels are high, but 35 weeks is early to be 2 cm dilated. They will check me again next week. If I am any more dilated, they want to give me a steroid to slow things down. 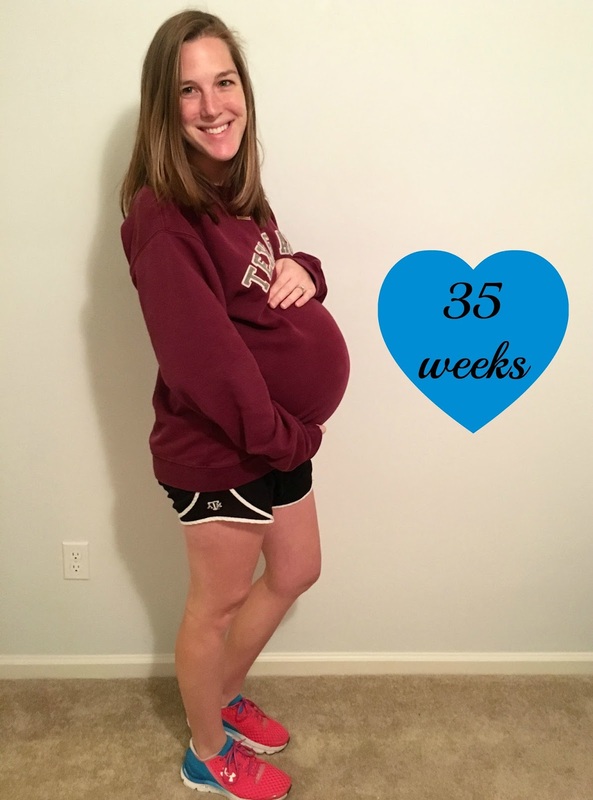 Even though he is big, the doctor would still like to see me make it to 38 weeks for respiratory development. Basically, it's a waiting game at this point. I gained 3 pounds since last week, bringing my total weight gain this pregnancy to 26 pounds. Most of my shirts (even maternity shirts) are belly shirts now. It's just hard to find something to fit this big old belly, so I rotate between the same couple of shirts every day. Parker came home the other day, looked at my outfit, and said "so are you going to wear that shirt every day?". Yes, yes I am. Towards the end of my pregnancy I rotated between the same two shirts haha. I was not about to go out and buy more. Oh wow I can't believe you're already 2 cm! Praying that baby's lungs will develop and his fluid levels will be okay! He is going to be here to soon! Love reading these update! You're more dilated than I was after over 24 hours of induced labor, haha! That's awesome. I remember the nausea coming back as well - no fun. But you're so close to the end!